My colleagues Jon Lange and Jeff LaLande and I are participating in this year’s campus theme series at Sothern Oregon University. 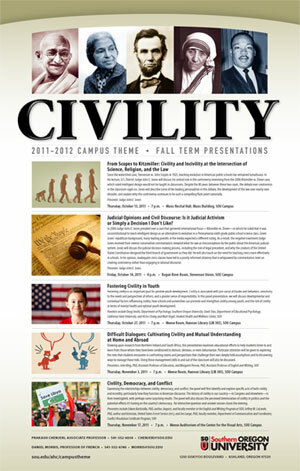 The theme this year is Civility and on Thursday evening Jeff, Jon and I will present a panel on Civility, Democracy, and Conflict. We’ll talk about both civility and incivility, looking at what civility is, some specific incivilities in American history, and speculate about the role of civility and conflict in a democracy. Join us on Thursday November 17, 2011 at 7 p.m. in the Meese Auditorium of the Center for the Visual Arts. We’ll present our material for a while and then open the floor for your questions and comments. This entry was posted in Literary Events in Southern Oregon. Bookmark the permalink.